This entry was posted in Blogpost and tagged economy, OECD, taxation, wages on April 12, 2016 by brianmlucey. Theres perennial talk on how we do, or do not, allocate more , or less, money to health care than the OECD. First, it is the case that we are, overall, spending more than the OECD average. Like all things however the devil is in the detail. When we look at the breakdown of this spend into public and private sources we see quite an interesting picture. We can see the precipitate decline in public spend post 2008. This is starkly illustrated if we rebase. The shift is very clear with private sources taking up the fall. Public spending on a per capita basis on current health spending has taken a mauling. b) allow the mix to continue to move as it has towards increased reliance on private sources, something which would please FG but which will be at the cost of increased chaos in the public health system. Either way, its going to be interesting. This entry was posted in Blogpost and tagged health spending, OECD on April 5, 2016 by brianmlucey. Financial Illiteracy – A Problem we are ignoring. Ten years on and we still don’t know what a tracker mortgage is, despite all the financial water under the bridge, the collapse of the banking system, and the taking into receivership of the state. We are financially illiterate in large part. And nobody seems to be doing much about it. This entry was posted in Blogpost, Journalism and tagged financial literacy, illiteracy, numeracy, OECD, PISA, SP, world bank on December 19, 2015 by brianmlucey. Ireland has a tax problem.. If we were to collect tax at Greek levels, we would take in €8b extra. Greece,…Think about that for a little while and wonder how we could spend that on investment, debt paydown, and increased social services. The chart shows how much more we could raise in taxation if we were to levy tax at the rate of our compeers. This entry was posted in Blogpost, Journalism and tagged economics, greece, OECD, tax, tax wedge on August 1, 2015 by brianmlucey. We as a polity are not big on evidence based policy. We rather form an opinion, then seek evidence for it, or better yet stay silent. This leads to suboptimal decision making, to put it mildly. The emergent debate on tax shows this in spades. This entry was posted in Blogpost, Journalism and tagged economy, OECD, politics, tax on April 18, 2015 by brianmlucey. This entry was posted in Blogpost, Journalism and tagged OECD on March 14, 2015 by brianmlucey. Should we benchmark taxes to lure back immigrants? The government seems to think so. Apparently its the income tax that is holding us back. Reform of the income tax system to encourage emigrants to return home is being considered by the Government in the run-up to publication of the spring economic statement. Under the plans, the tax system would be benchmarked against countries such as the UK, Australia, US and Canada. The initiative, which would focus on the marginal tax rates and middle-income earners, is aimed at encouraging emigrants to come home as the economy improves. Ireland’s tax competitiveness, especially on personal tax, has been identified as an issue to be addressed. Right. And if the government say it so and say it in the Irish Times, it must be so. 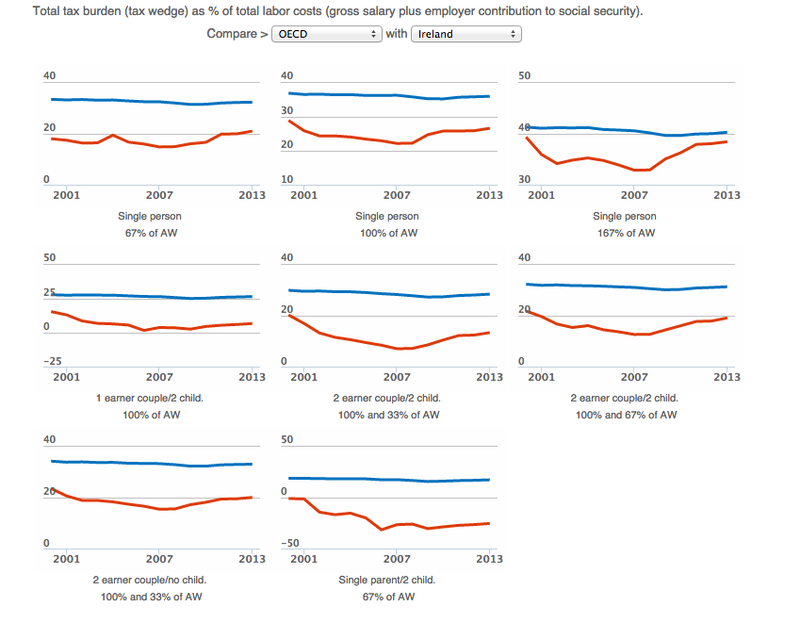 Here is what it says for Ireland as of 2013 (remember things have gotten better since then…). 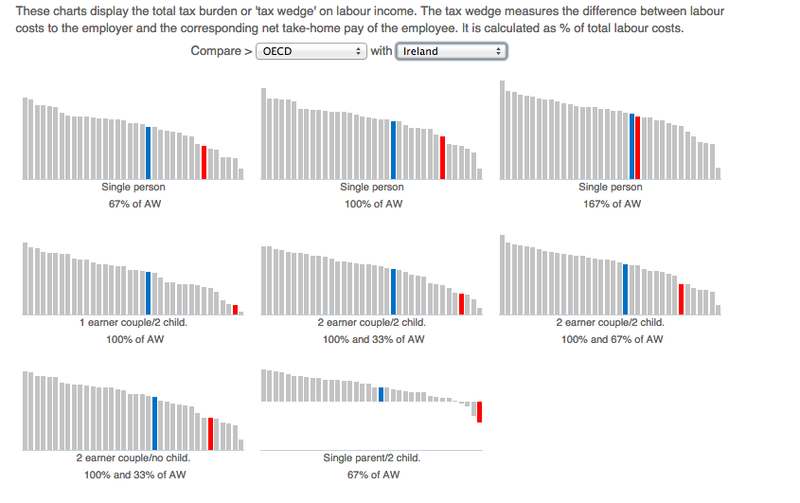 Ireland is in RED, OECD average in BLUE. No, this doesn’t take account of the cost of living, the water charges, the state of the roads or any other issue which gets conflated. Its about tax. Still think we should lower tax on labour? 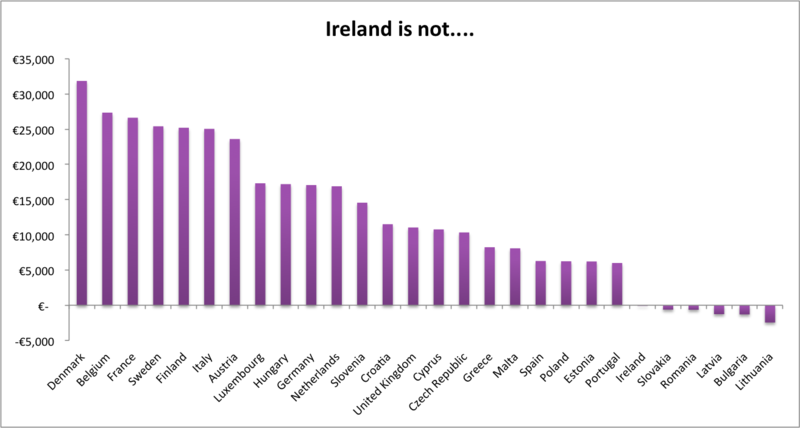 This trend, for Ireland to take a lower tax wedge than the OECD average, is a persistent feature of Irish tax policy. This entry was posted in Blogpost and tagged ireland, OECD, tax, tax burden, tax rates on February 6, 2015 by brianmlucey.